I had a conversation with a friend recently about this very thing. Have you ever been in the dark? I mean really dark. A space where literally zero light is present. I have. Touring Linville caverns in the mountains of North Carolina, our guide led us to an area deep in the mountain where we reached the water bed which slowly carved out the space we stood. After a word of warning, the guide turned off all electric lights. This was my first experience with true blackness. Even when you hold your eyelid shut while lying in bed at night, your mind do not experience this depth of darkness. In color theory, our minds perceive color when the receptors in our eyes receive light waves. White is the translation of receiving all spectrum wavelengths (all possible colors) at once. Every color we name ‘black’ is really just a shade of another color. Stare closely and your mind will begin to decode the light waves and pull out the hint of blue, yellow or red that is present in the deep hue you are looking upon. True black is only possible where no light waves can enter. In this cave was true black. Something else was present in this cavern. A life form that called this space home, somehow thriving in the blackness. Trout. These trout lived in blackness for all of their existence (until humans interfered and added electric lights for tourists). Surviving in utter darkness, the biology of the trout began to change. Just as our senses will strengthen and compensate when one of the five are lost, senses which go unused dissipate from lack of use. The trout which lived in this cave were blind. What does any of that have to do with confession? Being consumed by darkness. Darkness is heavy. There is a weight to it we feel in our emotions and through our spirit. The longer we spend under that weight, the more it effects our physical body as well. Heads hang, shoulders slump and backs become arched. Setting does this weight and escaping the dark frees us to stand with our head raised again. Jesus is the light of the world. Confession is an invitation to bring that light into your life and illuminate every part of you; the good, the bad, and the repulsive. God isn’t interested in a clean and polished fabrication of the best parts of ourselves. He wants every piece of us. Law reveals guilt, love reveals grace. The smallest source of light can chase away darkness. No amount of darkness can be added to conceal light. Jonah’s adventure is the gospel in literary form. Grace, fall from grace, consequences, anger, repentance, and the return to grace. In no way can I judge the heart of Jonah as he found himself washed up on a Mediterranean beach. What I do know, is that he accepted his mission and made his way to Nineveh. I imagine, from his retreat into exile that led to his three-day isolation, he still has some apprehension about this trip. Nineveh is the bully of the world at this point. Jonah would like nothing more than to see God eradicate this city from the earth, yet his mission is to lead Nineveh into God’s grace. The literary tool heavily used in the recount of Jonah’s tale is one which expresses the largeness of the main players and the circumstances. God is a big. Nineveh’s sin was big. The storm was big. The fish was big. Our semblance to Jonah is becoming increasingly clear. Though we are not all commissioned to preach repentance to a major city, we are all called to something bigger than ourselves. The bigness of Jonah’s adventure is not emphasized by chance. Putting ourselves in Jonah’s shoes, the first thing we’ll discover is the bigness of our sin. No matter how pure a façade you put on or how good you think you are, things are always worse than they appear. You never find yourself immersed deeper into sin than when you see others as worse sinners than yourself. If we only conclude the problem is “out there”, we completely miss the concept of grace. The problem is always “in here”; your decisions, your motives, your attitude, your hypocrisy, your selfishness. Sin is no respecter of persons, selfishness freely invades the mind of every human being. Recognizing the presence and tactics of this enemy is the first step toward taking back your self-control. Once we ourselves and our sin in perspective of its bigness, the massiveness of God’s grace is brought into focus. Grace is also no respecter of persons. God freely offers His grace to all humanity, regardless of their past. Grace is freely available through repentance, no questions asked. Even Nineveh, who blended extreme narcissism and extreme brutality into a way of life, had God’s graciousness liberally spread over them at the moment of their repentance. After grace comes commission. Our responsibility is to choose grace through repentance, we then prove our honor by our service. Like His grace, God’s mission is enormous. The creator of all things is heartbroken over the selfish path His creation has taken. His mission is to re-create all of creation through the lens of perfect selflessness. Nineveh was not the only target in God’s mission for Jonah. Jonah, the sailors on their way to Tarshish, Nineveh, Israel, you, me; we are all targets in God’s mission objective. Jonah made the mistake of thinking Nineveh’s destiny rested souly on his shoulders. He was just as self-consumed as Nineveh, believing it was only by his grace that God’s could be offered. After delivering a intentionally blunt and vague warning to Nineveh, the city did the thing that Jonah feared most; they mourned over their sin and repented so corporately that God spared the city. Nineveh’s outward expression of repentance is the image that stuck in my mind as Dean spoke this morning. To be so broken that weeping alone is insufficient for expressing your grief. Only by reducing your physical self to the lowest stature your culture recognizes, replacing your soft cotton clothes with a rough burlap sack and covering your head with dirt and ashes decomposing on the floor of a fire pit, there is little question of the integrity of one’s mourning at this point. One of my medium’s of choice is charcoal. I enjoy the raw, natural feel of drawing with compressed ashes and using the natural oils in my fingertips to manipulate the hue and intensity of the charcoal color. I started today’s drawing by expressing the grief of Nineveh, covering the page with a heavy layer of vine charcoal. Next, I firmly pressed my open right hand onto the page, removing charcoal from the page and leaving an impression of my skin. With the hand defined, I darkened the area around the hand with compressed charcoal and blended it into the vine charcoal with my finger. Pressing my hand onto the page once more, I pulled off any compressed charcoal that spilled over into the white space and created this finished image. God’s grace is substantial enough to remove every blemish from your soul. His grace is bigger than your past. By His hand, He can make all things clean again. You are Jonah, but your story is not about you. Look at Him. The purpose of the series ‘How to Wreck Your Life’ was to expose idolatry. Over the last three weeks, we’ve talked about how, if’ we’re not careful, we can take a good thing, elevate it to being an ultimate thing, and turn it into a ‘god’ (little ‘g’) thing. Without correcting our priorities, this god thing eats away at the foundation of our ultimate goal until it is irreparably damaged. We know to make God our ultimate focus, we have seen red flags popping up in the places our life’s focus has become skewed, we’re not proud of our poor prioritizing, but it’s where we’re at; so now what? When we know we’ve idolized some area of our life, good or not, what can we do about it? Repent. Don’t say you’re sorry and promise not to do it again; intentionally change your mindset by making changes to you priorities. 5 Put to death therefore what is earthly in you: sexual immorality, impurity, passion, evil desire, and covetousness,which is idolatry. 6 On account of these the wrath of God is coming. 7 In these you too once walked, when you were living in them. 8 But now you must put them all away: anger, wrath, malice, slander, and obscene talk from your mouth. 9 Do not lie to one another, seeing that you have put off the old self with its practices 10 and have put on the new self, which is being renewed in knowledge after the image of its creator. Will that be the end of it? Unfortunately, not. We have to constantly keep ourselves in check, cycling through having everything in order, something flashing catching our eye and drawing our attention, realizing that shiny thing is not as important as we thought, and repenting by putting everything in order again. Martin Luther nailed this aspect of life in number one of his ninety-five theses; all of life is repentance. Luther understood we are fragile, weak beings that will not maintain a righteous lifestyle even with the best intentions. Life is a constant cycle of trying, succeeding, failing, and repenting. The comparison to life as a cycle in the context of repentance immediately got my neurotransmitters firing like a Fourth of July fireworks finale. My imagination settled on an Ouroboros, an ancient icon of a serpent eating its own tail, consuming itself and regenerating itself simultaneously. A what?! I’m sure many of you wonder. Allow me to explain. The Ouroboros originated in ancient Egypt but its name is Greek, Οὐρά (oura) meaning “tail” and βόρος (boros) meaning “eating”. Referenced in many cultures, the Ouroboros carries a common theme of life, death, and rebirth; the cycle of life. The Christian life follows the same cycle, life is found when we are born in Christ, the physical body dies, then we continue our spiritual life in heaven. Applying it to the Christian walk, we begin a place where we are close to God, aligning our priorities with his, trusting his direction and ignoring our desires; this is the ‘birth’ stage of the Ouroboros. As life goes on we grow comfortable and confident, without keeping ourselves in check comfortable evolves into entitled and confident into arrogant. We let go of God and latch on to that shiny thing that becomes our god; this is death. The cycle completes when we look up and realize life is not what we thought, we acknowledge our poor choices led us down a path we wish we’d avoided and we re-embrace life as God intends. This is re-birth. Historically, the Ouroboros is manifested in the form of a snake of a dragon. 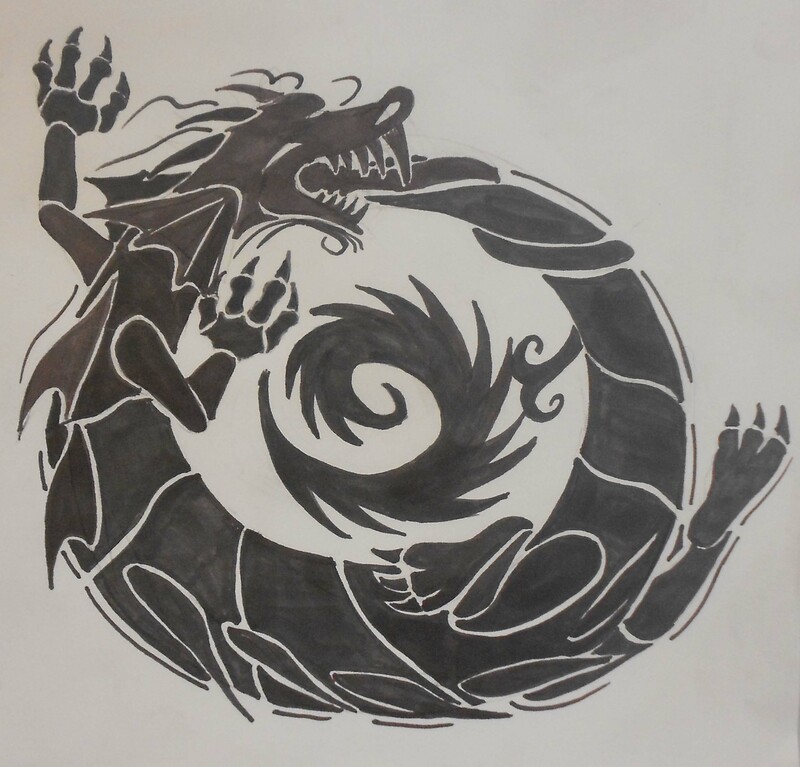 I chose to create my Ouroboros in the form of a dragon and in the style of a tattoo. I am not familiar with the art of tattoos and don’t necessarily prefer dragons to snakes, so I’m not completely sure why I landed on this design. Julie and I watched “The Girl with the Dragon Tattoo” last night (an excellent movie if you like a good mystery), I’m sure that has a lot to do with it!